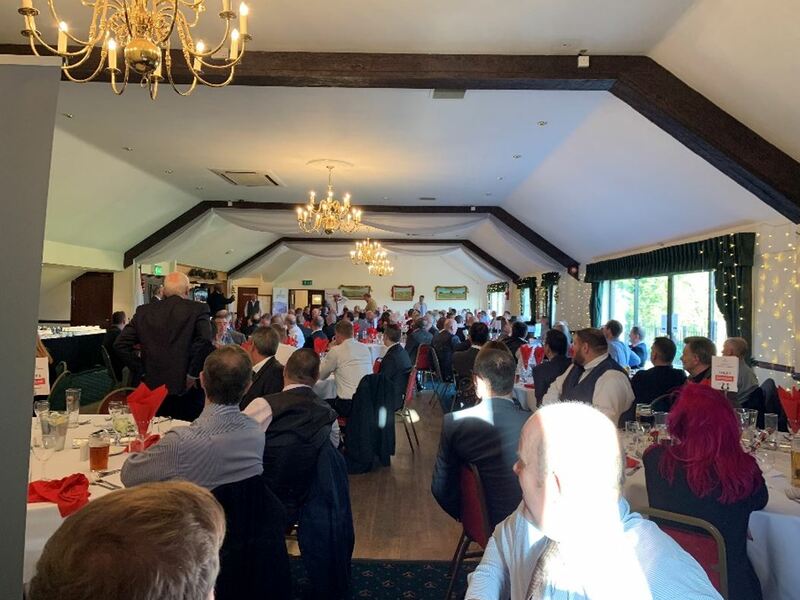 On Friday 7th December 2018 the Central Club hosted their most successful Annual Christmas Lunch at Drayton Park Golf Club, in rural Southern Oxfordshire. Hosted in the upper floor of the large open plan clubhouse, all 220 guests were welcomed and accommodated in the warm and cosy dining hall for a fun and festive afternoon, raising money for our construction workforce in need. Guests were invited from all over the Oxfordshire and Berkshire area, from a range of construction firms and backgrounds, making the event even more interesting for all. Guests swiftly arrived from 12pm when the bar opened, with everyone seated and food served from 1.30pm. The menu was enjoyed by all, starting with a Cotswold game terrine, followed by tender 24 hour braised beef, finishing up with a delicious bitter chocolate nemesis. It was a joy for the committee to be able to welcome Ian Irving as our comedian and MC for the afternoon. Ian was an asset to the day, hosting the tradition of Heads & Tails, raffle and auction as well as giving a fantastic after dinner talk. The raffle and auction were both very popular, with prizes ranging from chocolate fondues, to champagne and hampers and auction lots ranging from golf days to helicopter flying lessons – guests couldn’t afford to not take part! With the help of Ian and all guests on the day, the Central Club were able to raise over £10,000 – making it the most successful event they have had to date. The day wrapped up around 7pm with nothing but positive comments from those who attended. After the great success of the 2018 Christmas Lunch, finalisations are being made with Drayton Park for this year, to be held on 6th December 2019 – the event we hope will be even bigger and better than ever before! Special thanks to all guests and sponsors for helping to make the event successful. In particular, we would like to thank: The McKenna Family and all at Drayton Park Golf Club, Oliver Curran Construction, Earthline, H Tuckwell & Sons, Pye Homes, Sheehan Group, Drayton Construction and Leach Lewis Rubber Tracks.